A front load washer that won’t fill with water can put a real hitch in your day. Not only are left with a hamper full of dirty clothes but now you have to figure out the cause behind your non-filling appliance. Before your stress level leaps to new heights, take a deep breath, and keep reading to learn which faulty components typically lead to a Whirlpool washer model WFW75HEFW not filling and how you can fix the malfunction. Before taking apart your washer to fix it, unplug it from the wall and turn off its water supply. During the repair process you’ll encounter many sharp objects; wearing work gloves and safety goggles to protect yourself is a must. Before you disassemble your appliance looking for a defective component, check your washer’s fill hoses. The hoses run from your home’s water supply valves to the back of your machine. If they become twisted or kinked, they can stop water from entering the washer. Pull your appliance away from the wall and examine the state of the hoses. If everything looks good, unthread the hoses from the supply valves, and inspect the small screen filters attached to the end of each hose. A clogged or damaged filter can also stop your machine from filling, meaning they will need to be replaced if they’re the problem. At this time, we also suggest testing your home’s water pressure. To do so, reattach the fill hoses to your washer’s water supply valves, and then unthread the fill hoses from the back of your appliance. Place the free ends of the hoses in a sink or bucket, and turn on the water supply valves. If the water trickles out, you have a water pressure problem. If it doesn’t and nothing else is wrong with the fill hoses, it’s time to examine other possible malfunctions. 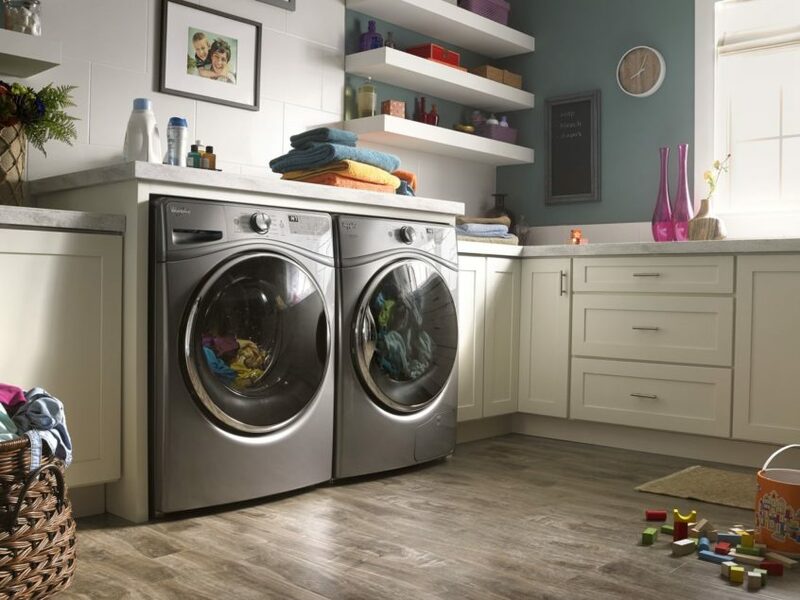 In your front load washer, the water level pressure switch detects how much water is in your appliance’s tub. Once it measures the water level, the switch sends a signal to the water inlet valve, which tells the part to keep filling the washer or to stop filling the washer. If the pressure switch is faulty, it can send the wrong signal, which can prevent the water valve from filling your appliance even when it’s empty. At the back of your appliance, use a nut driver to unthread the screws holding the main top panel to the washer cabinet. Detach the panel by sliding it back and lifting it up. Place the panel somewhere safe and out of the way. Locate the water level pressure switch inside the washer cabinet on the appliance’s side panel. Remove the switch by rotating it and pulling it out of the side panel. Next, disconnect the wire harness attached to the pressure switch. Then, pull the pressure tube off the bottom of the switch. Insert the new water level pressure switch into the pressure tube. Install the switch by pushing it into the slot on the washer’s side panel, and then reconnect the wire harness. Slide the top panel back on the washer, and secure it with the screws you took out earlier. Now that your washer has a new water level pressure switch, plug it in and turn on its water supply. When the door on your front load washer is open, the door latch stops your appliance from filling with water. Unfortunately, when the mechanism is malfunctioning, activating the latch by closing the door may not prompt the water inlet valve to open, meaning the washer will remain empty. Open your washer door and remove the outer clamp which secures your appliance’s boot seal. Once the clamp is free, take the seal off the lip of the washer and push it into the tub. On the right side of the front panel, locate the screws that secure the door latch to the washer. Unthread the screws, and remove the door latch from inside your appliance. Then, disconnect the wire harnesses that run to the component. Now that the faulty door latch is out of the way, you can install the new latch. Start by connecting the two wire harnesses to their proper terminals. Next, attach the door latch to the back of the washer’s front panel, and secure it with the two screws you took out earlier. Resituate the boot seal on the lip of the washer’s front panel, and replace the clamp to secure the seal. Shut your washer door and plug-in your appliance. Turn on the water supply and start a wash cycle to test out your new door latch. The water inlet valve controls your washer’s fill function. If the valve is faulty, it won’t open, meaning water won’t enter your appliance’s tub. Replacing the damaged inlet valve is the only way to fix the issue. Unthread the hot and cold inlet fill hoses from the inlet valve on the back of your washer. Don’t be surprised if a small amount of water drips out. Remove the screws holding your appliance’s top panel on. Slide the panel back and lift it off your machine. On your washer’s back panel, take out the mounting screw that secures the inlet valve to the appliance. There is a wire retainer attached to the washer’s support brace, push it down to unhook it. Now push the water inlet valve out of the washer, and disconnect the wire harnesses running to the component. The water inlet valve has two hoses attached to it. The hoses run between the valve and the detergent dispenser. Using a pair of pliers, loosen the clamps securing the hoses to the dispenser and pull them off the component. Now that the inlet valve is completely disconnected from the washer you can remove it from your appliance. Start installing the new water inlet valve by attaching the hoses to the detergent dispenser. Use needle nosed pliers to tighten the clamp, and secure the connection between the hose and the dispenser. Reattach the wire harnesses to the correct terminals, and insert the water valve into the washer’s rear panel. Secure the valve by installing the two screws you took out earlier, and push the wire retainer back into the support brace. Slide the top panel back on your washer and reinstall the screws. Connect the hot and cold inlet fill hoses and turn the water supply back on. Plug your washer in and hit the start button to find out whether or not the new water inlet valve resolved the malfunction. Repairing a non-filling washer isn’t always an easy fix. If you’re having a difficult time and need help, please contact us today and we’ll send one of our highly skilled repair technicians to your home to diagnose and fix the malfunction.